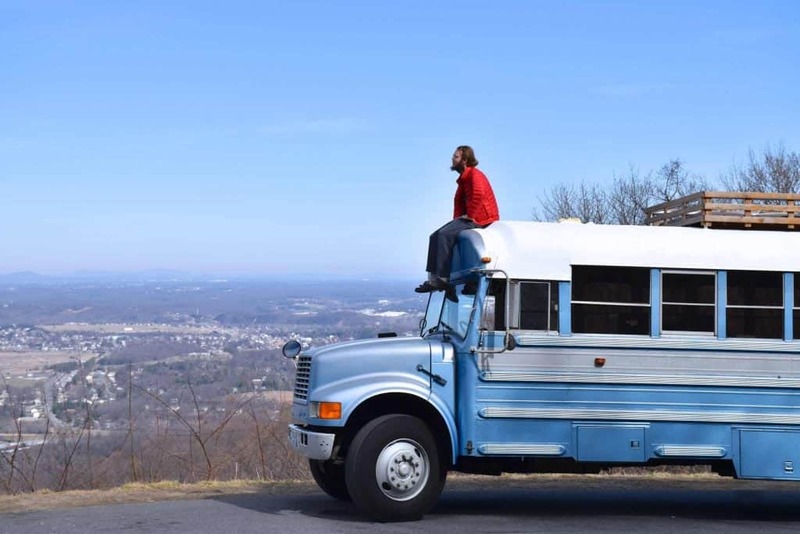 Have you ever thought about living in a school bus conversion? 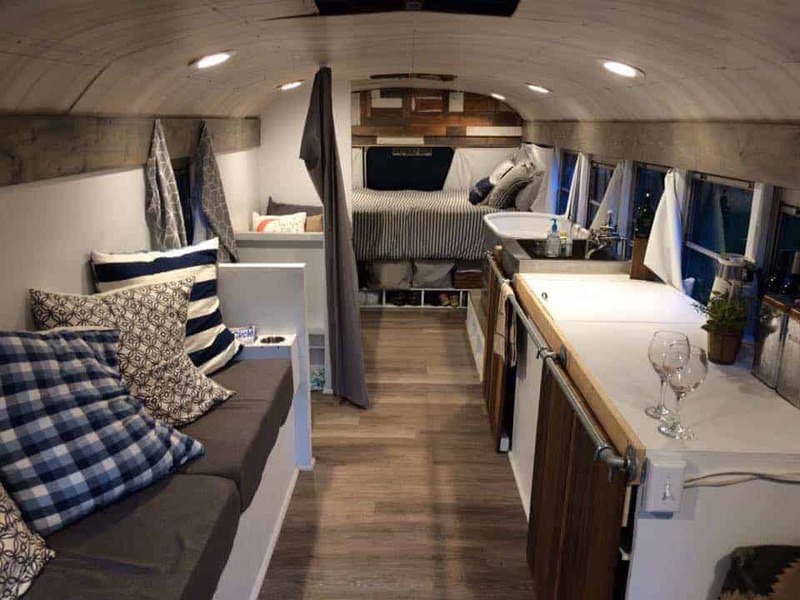 More people are choosing to live in a school bus rather than a traditional RV. Converting a school bus gives people more flexibility when it comes to designing their living space. School buses are built to carry children, which means they have an extra level of safety and hardy construction over traditional RVs. Plus, a school bus conversion is upcycling at its best – taking something that’s no longer used for its original purpose and giving it a new one. It’s also the ultimate DIY project, which involves lots of learning, building and materials. The result can be a gorgeous tiny home with your own touches, perfect for road tripping across the United States. 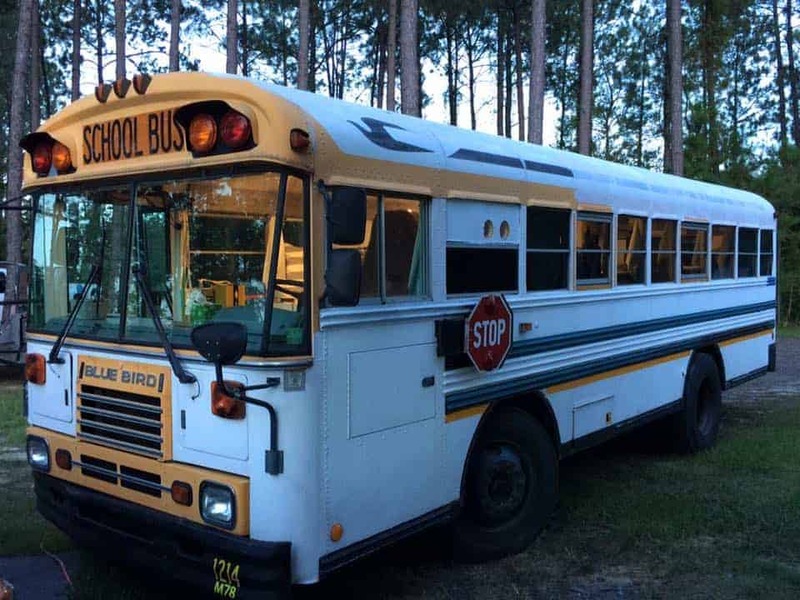 Why are people choosing a school bus conversion? Derek and Amy Cobia of The Frugal RVer didn’t start out with a school bus conversion. Their first RV was a large 5th wheel camper hauled with a pick-up truck. They hoped to save money and travel, but soon realized it wasn’t going to happen. They wanted something off-grid and small enough to have a good turning radius. 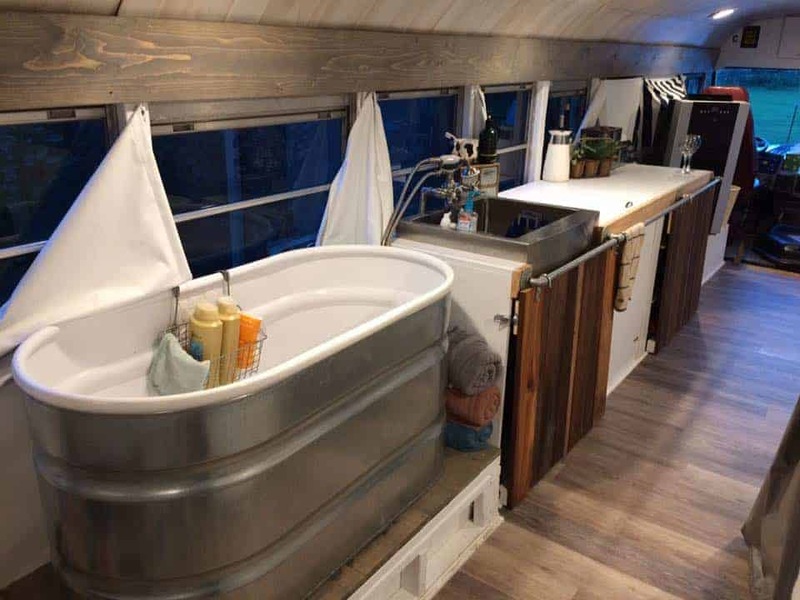 So, they turned their attention toward living in a bus rv conversion. They two started looking at school buses to convert and found one for just $3,000 and 27 feet in length. They started brainstorming ways to transform their rig into a tiny home. Their budget was $15,000, including the school bus, and the couple thinks they may have gone a little over, but still ended up under $20,000. They have everything hooked up for solar – the electrical system alone was $6,000. He said its harder to maneuver the bigger school bus campers, so some people who buy those feel frustration. 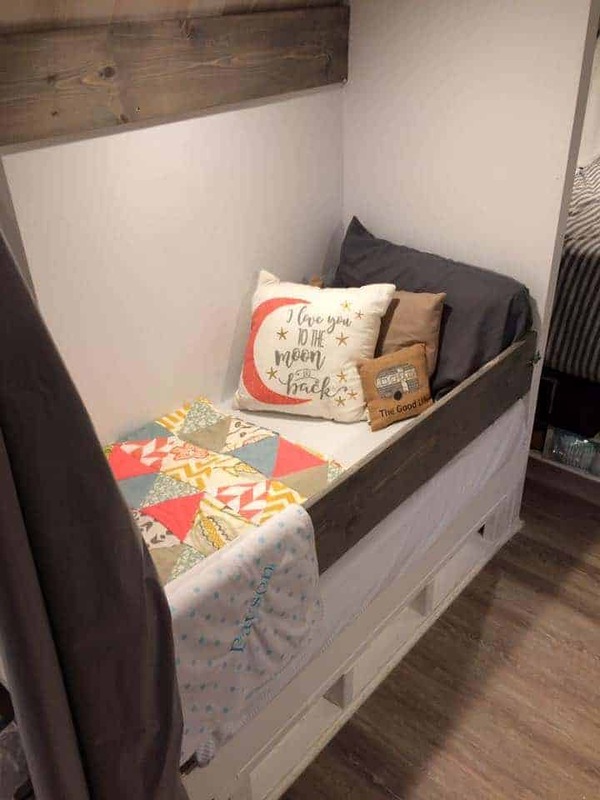 The school bus camper even includes a little bed for their 2-year-old daughter, who so far is loving the skoolie life. 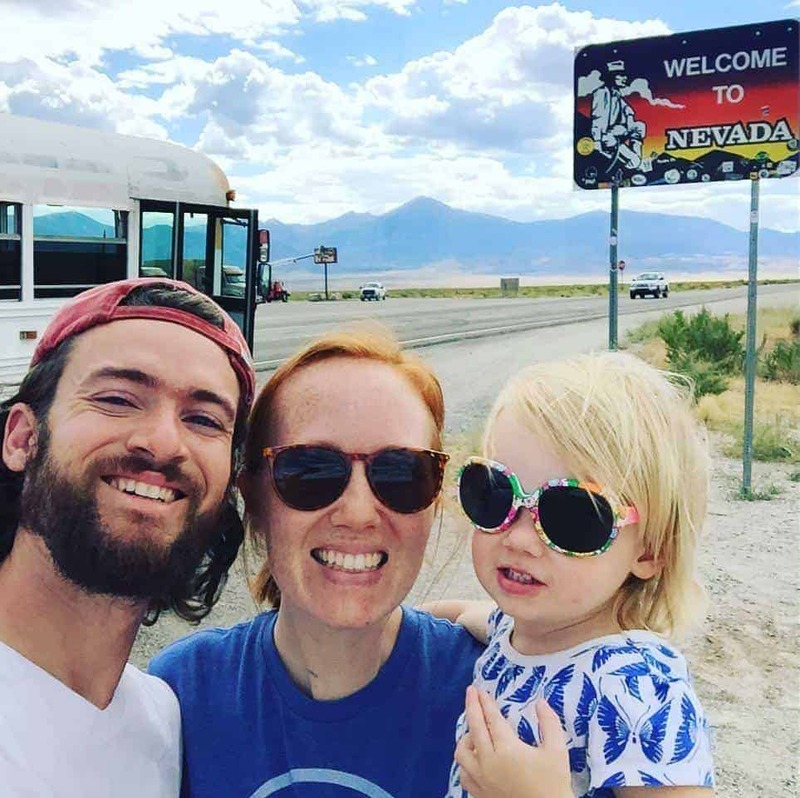 So far, the family of three has driven across the United States, mostly boondocking, or camping for free. They’ve only spent $50 on their journey. They plan on traveling indefinitely and say if you’re thinking about doing it, do your research and understand the costs before committing to a school bus conversion. Patrick Schmidt of Skoolie Love was living in Seattle when he first wanted to buy a school bus to convert into an RV. He searched Craigslist for days, eventually finding a 34-foot blue school bus for sale in California. It had once belonged to a church. So, he flew to get it and got a good deal. “I bought it with just 68,000 miles on it. It was for sale for $5,500 initially, but when I told the pastor I wanted to travel and expand my life and have adventures, he was thrilled and sold it to more for just $4,500,” Patrick said. To qualify as an RV, the school bus camper needed a few things. A bed, a way to cook, a way to provide cooling and heating. He decided to install a hot plate and plumbing for a toilet, water and a shower. 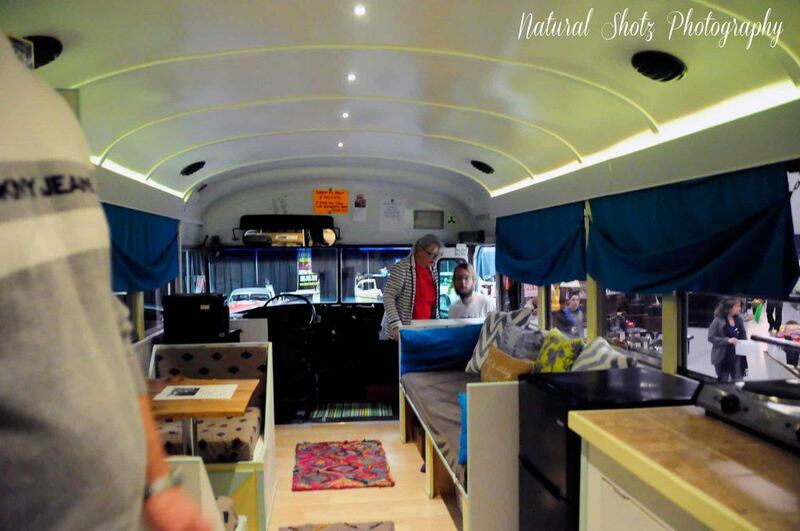 Now, it’s basically an entire apartment, 189 square feet on an awesome school bus conversion. While Patrick enjoyed his newfound freedom, he also found it challenging to live in a school bus conversion. 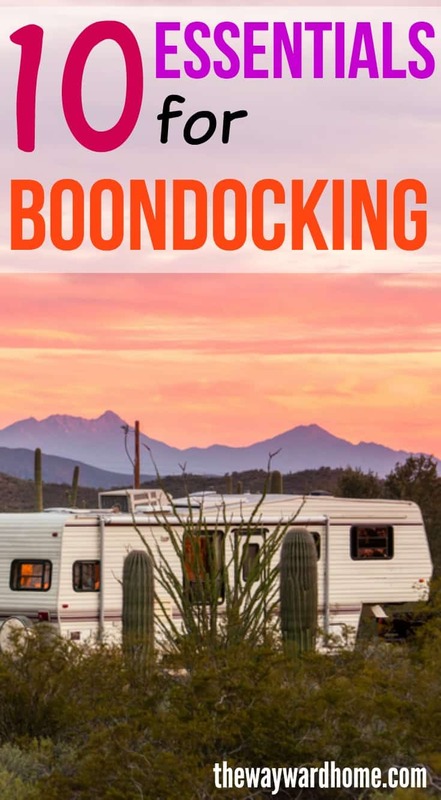 Many campgrounds only want RVs, or vehicles less than 10 years old. School buses are conspicuous to park on city streets. If you want to settle down in a big city in a skoolie, it’s not easy finding a place to legally park it. He said finding insurance for a school bus conversion is also a challenge. Patrick said he’d be the first to tell someone not to live in a school bus conversion. He said the bus only gets 7 to 9 miles per gallon, which is very expensive if he wants to keep moving and traveling. So, he started a business selling t-shirts, where you can see here. He does hope that the more people who live in a school bus camper, the more that things will change. Maybe cities will be more welcoming to school buses. Maybe insurance companies will offer cheaper policies. Maybe there will be better places to park. Maybe in the future, we’ll see just as many school bus tiny homes as we’ll see school buses taking kids to school. You never know! Im in the process of designing my skoolie and your cabinets caught my eye. Are they barn doors, curtains…? I’m in the PNW (Pacific North West) and have been looking into medium sized Skoolie’s for many years. Parking the beast is my biggest issue!! It seems like parking for a period of time is just way to expensive! I prefer not to live via Wally World and Rest Stops. The boonie’s are nice but limited as well. I guess there is no way around the issues of maintenance, parking and insurance. Apartment rent would be cheaper combined with a regular car to get out and see various sites. I’m really bummed. Yeah skoolies do seem to have their downsides. They are nice and big, like an apartment, but I think parking would be a pain. I think I’d give a vote for a van if I was going to have something for the road. I’m using my Suburban at the moment. It serves as shelter and is good on fuel. I’ve used a Conversion Van for a while and it’s still pretty cramped. Perhaps a high top van? A bit more space like a small Bus or Step Van will be more comfortable, but stealth camping still has its drawbacks. Nothing is perfect and it’s about lifestyle. It all seems to come down to budget and time. What doesn’t? Totally! 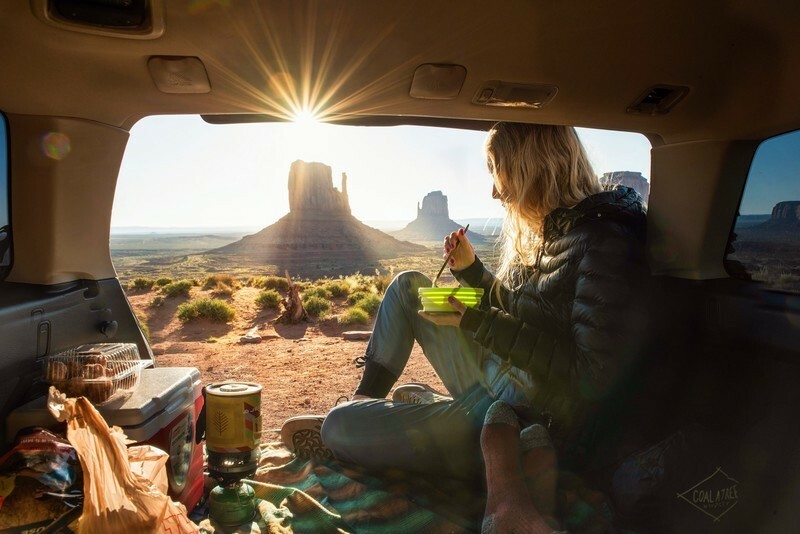 I really would like a conversion van…a high-top would be nice for standing room, but one van life lady I know drives a Ford Transit Connect she got for $11,000. Usually, my boyfriend and I roadtrip and sleep in a Prius, so anything will feel roomier to me, haha! I drive a school bus and honestly it’s easier to parallel park than my private car. The cost for parking in the city would definitely cost more though. Thank you for the article, my son is doing the same. He will be driving cross country from AR to WA. I understand finding a parking is a nightmare. Is there a list of schoolie friendly parking options please? That’s actually a great idea for an article. I will look into it! I know skoolies are very hard to park, sadly. Wal-Marts allow you to park campers and RV’s over night. I don’t see why they wouldn’t allow a school bus conversion. Check ot out. Totally, I think some WalMarts would, but people should call the WalMart first to make sure. Did you paint the inside of the bathtub or is it some type of plastic lining? You guys are living my dream in such a beautiful home!! You’ll have to ask the owners of the schoolbus, the Frugal RVEr! I’d guess they had it porcelain glazed. I’ve seen that done on other horse trough tubs and it looks just like that. I love your bus! Great job! Can you tell me where you bought your bath tub? Many thanks!! That’s a galvanized stock tank for watering livestock and horses. Any farm and ranch store like Tractor Supply, Atwoods, etc will either carry them or be able to get you one. They come in several sizes, run 2 ft high. I have one that’s 6 ft long like that, and they also make round ones that I think would be perfect for a shower base. There’s a drain in the side along the bottom edge so you’d need to put in a floor drain. I am still working on my tiny kitchen, but thinking ahead for my tiny bathroom. I see from the pictures you have a galvanized stock tub. I want one, but would like to paint it to give it a bolder statement. Plus the local Tractor supply stock tubs come with a logo on them I would like to cover. I was wondering what did you use to coat the inside of your stock tub? Hey Grace – you’ll have to contact the owners of the bus to ask that question. 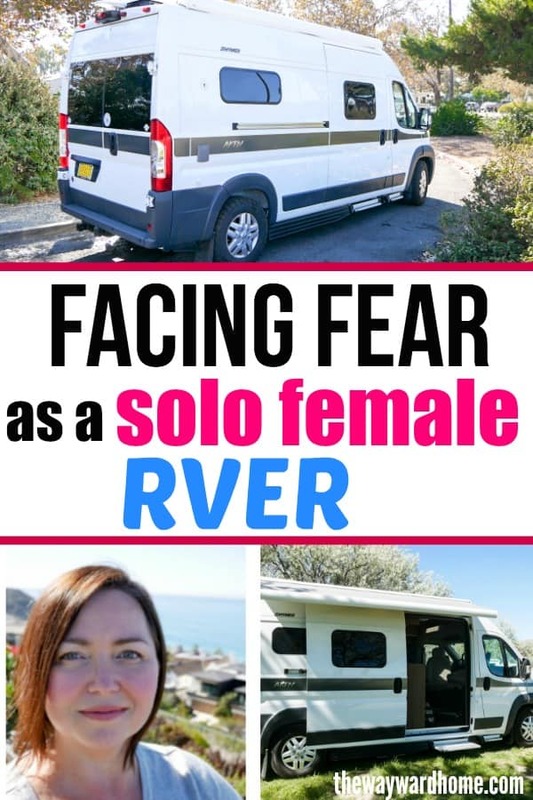 They are known as The Frugal RVers and have a website and Facebook group. Does the truck p/u w/camper work anymore. Yep! I see a lot of people doing pickup campers. I should write a blog post about that, actually. Looks like it has been awhile since anyone has commented here. Just dropped off to nothing. Anyway, to share our experience with the “skoolie” life. We have lived in our bus for 16 years, and loved most every moment of that lifestyle. “Full Timers” is how we described ourselves. We actually owned two buses. The first was a 1980 Gillig, 78 passenger with a 250 Cummins, 5speed manual transmission. We lived and traveled in it for 10 years. Then we got a deal on a 88 Blue Bird which had more floor space(38′) inside. We both did all the conversion work ourselves. The learning curve went up after the Gillig. Insurance seems to be a big problem, but we were with State Farm insured as an R.V. We took our agent for a long ride (200) miles, and wrote up a policy showing us as a motor home. Even with the wood burning stove we only paid $ 325 a year. Wow, this is all so interesting. Thanks for adding your two cents!